If you like the calming effect of seeing fish effortlessly swimming and sliding in the water, I have an artist just for you. Now let us dive into his water wonder land. Riusuke Fukahori(深堀隆介) is a Japanese artist born in 1973. After graduating from Aichi Art University Department of Design in 1995, he went into corporate job in advertisement, but leaves the job in 1999 to pursue artwork full-time. His life takes its turn the next year when his career reached low point. One evening the young artist in slump casually looked at a fish tank he’d kept his goldfish for seven years. Through rather filthy water, there was this goldfish. The scales were flaking, one eye lost, surviving with almost zero human interaction. Fukahori suddenly realized the beauty and madness. Woken up by this life force like a beacon of light, he started drawing the goldfish frantically. This incident marked such a vivid experience that it led him to use goldfish as the only subject for his artwork. This was the night a Japanese goldfish artist was born as we know of him today. To fully create his vision into reality, Fukahori invented original method. His goldfish is made in such a lifelike way that it is almost hard to believe it is purely a human creation. He first pours a layer of resin, lets it dry, and then pours another layer of resin, repeating this process until he makes a three-dimensional representation of the subject. Some of his works take several months to gradually complete, layer by layer. His work is widely recognized and his fan base spread throughout the world including Germany, England and America where he had his artwork exhibited. Record shows Japanese first welcomed goldfish in 1502 from China. First it was considered expensive hobby to keep goldfish and it was often used as display of wealth, then by middle Edo period goldfish became more common for people to enjoy as a pet. Many people seemed to have enjoyed keeping them during summer to forget the heat, since a word ‘goldfish’ became seasonal word for ‘Haiku’ (Japanese short poem written with seventeen syllables). They were also popular subject of ‘ukiyo-e’ as well. Goldfish became a familiar character of Japanese summer scene for art and literature. Kuniyoshi Utagawa(歌川国芳) is one of the most renowned ukiyo-e artist of the late Edo period (1603 – 1868). He is well known for his highly skilled dessin technique and using his artwork to let out public political frustration. He created a hundred series starring goldfish to comically showcase people’s daily lives and customs. If you’ve ever been to Japan, you’d see goldfish is still one of their favorite characters used as a decoration during summer. It is drawn on handheld fan and printed on Tenugui (thinly woven cotton cloth traditionally used as towel or handkerchief). 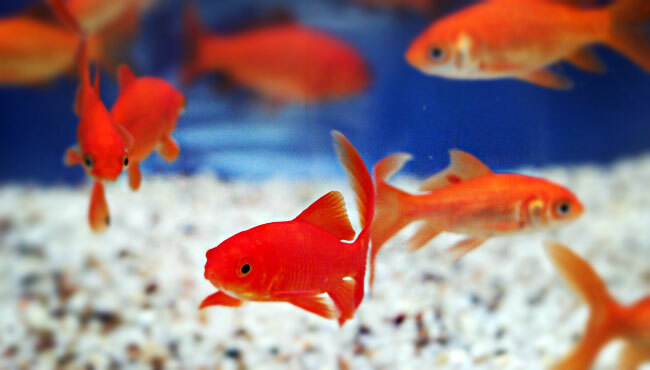 You can also find ceramic goldfish at home décor stores (during the World War 2 people believed that having goldfish in the house would keep them from bomb attacks, although the belief has been long lost). Goldfish is a small member of the carp family and is carefully bread among those with the same genetic color mutation. The balance is so delicate that if it were to breed naturally without human interference, they would all go back to its original color of gray or silver within some generations. Goldfish need constant modification to keep their identity. Just as goldfish need us for their survival, we enjoy their companionship. We will continue to keep each other close and goldfish will always be part of artist’s inspiration. So why are we so moved by Fukahori’s works among many others? What is so special about this particular artist? I’d say the reason is that he was able to invent method that most suited his expression and the timing couldn’t have been more perfect for us to see. Fukahori’s work vividly displays human society; just as goldfish is meant to live in a fish tank and never in the wild, we humans are assigned to be in a society with certain level of expectation to be something and to behave in certain way. Especially when I realize many of his goldfish are facing the same direction, I cannot help but think of how suffocating and small the container is and how they too are trying to shine as individuals no matter how similar looking they’re modified. The beautiful balance of vulnerability and strength they have, and yet how effortlessly they seem to carry on with their lives. It all starts to hit us together. It could not have touched us this much if it didn’t look as real as Fukahori’s work. There are usually both good and unwelcoming factors to any situation no matter how ideal it seems from outside. That is why we keep trying to work towards better results and higher goals. Looking at Fukahori’s very modern goldfish artwork, it reminds us of both living in harmony with others and countless possibilities we have for facilitating our own life. It is true we sometimes feel like living in a cookie cutter world. We may sometimes feel like we’re expected to be something or someone. But still we are given the choice to shine in our best way how vulnerable and imperfect we may be. Hokusai Daughter, Oui Katsushika, Is Another Genius!